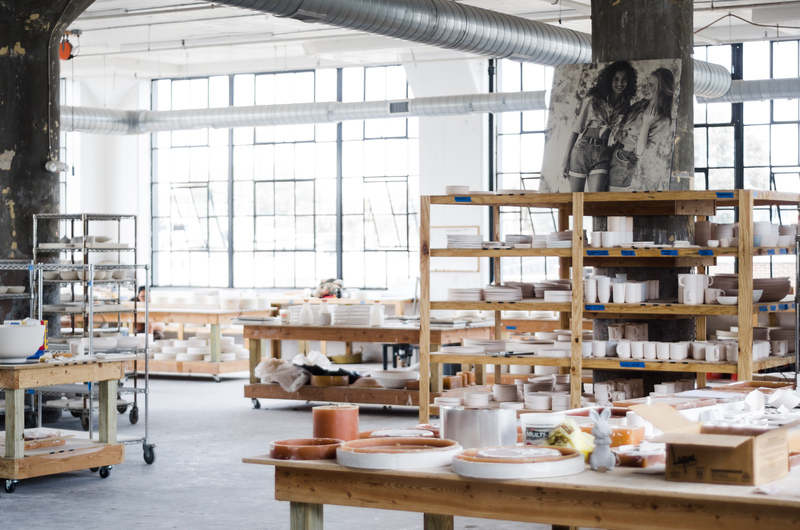 This must begin with a bit of a caveat to fully set the scene for our studio visit with Philadelphia’s Felt + Fat. Books, covers, no judgments—a friendly reminder. For a business known for their delicately beautiful porcelain wares (the marbled stuff of dreams), the sight of a car burned through with acid bringing North Philly realness ten feet from the door of MaKen Studios was a quick wave of cognitive dissonance. When Nate Mell, one half of Felt + Fat, opened an unassuming door to welcome us inside, we gripped up our nerve and prepared ourselves for a slightly more gonzo interview. But once Nate opened the standard-issue office doors to their studio, where they lord over the lion’s share of the third floor, the true beauty (and absolute enormity) of Felt + Fat’s production space spills into the dark hallway that leads to it. Light! Pure, unadulterated natural light! The most precious of studio commodities! 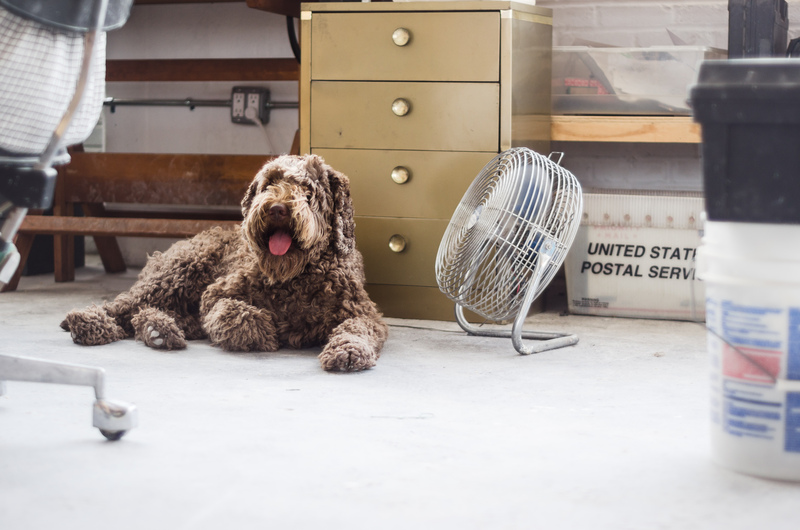 Rufus the Labradoodle, and the second most precious commodity as the shop dog, eagerly greeted and goosed us in equal measure as we took in the 5500 feet of calm but bright energy. A few employees and interns were peppered about a number of massive wooden tables, quiet and focused on their delicate work. 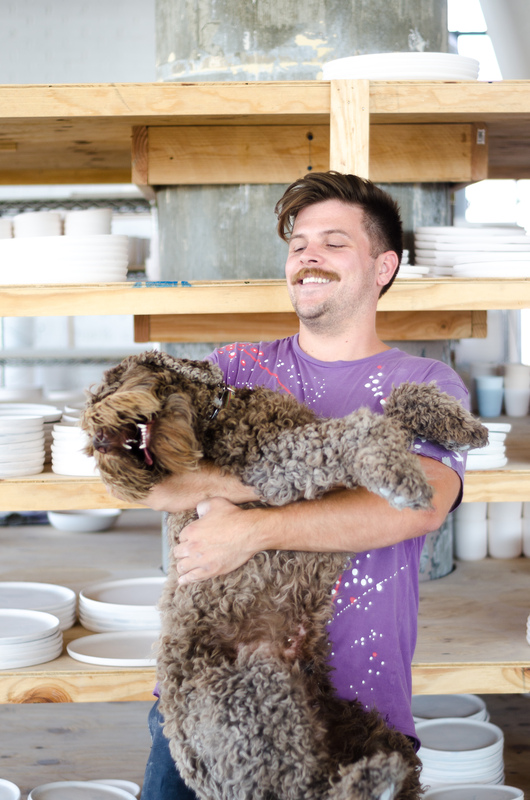 Wynn Bauer, the other half of Felt + Fat, joined us from where he was glazing pieces from intimidatingly stocked shelves of waiting bisque ware. Some history is due. 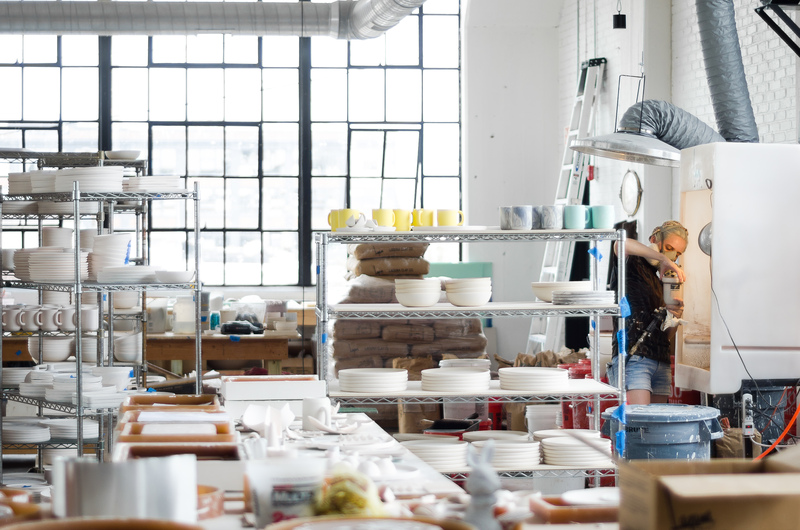 Felt + Fat presented itself in 2013 as the answer to an initial opportunity for Nate and Wynn, who met at The Clay Studio in Old City, where Wynn also taught classes. The two speak of this time in their individual lives as feeling particularly ripe for change and direction. 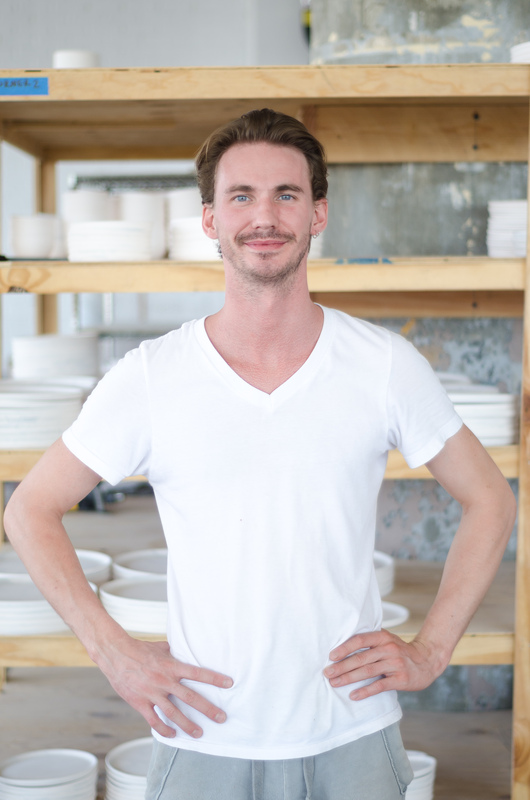 Through his relationship with Chef Eli Kulp of the much lauded Fork restaurant, Nate was challenged to create a limited run of porcelain dinnerware for his next venture, High Street on Market, and he smartly enlisted the help of Wynn to get it done. A Ceramic Shop exclusive tidbit: the first batch turned out lavender, and not the darker slate they wanted. “We definitely learned a lot from that experience,” says Nate, with the weary confidence of an artist who has survived many make it work moments. The Felt + Fat aesthetic is clean and bright, playful even, and this is reflected in even their choice of name, which combines the two favorite subjects of German artist Joseph Beuys: felt and fat—one manmade, the other organic, combined by a memorable plus sign in a sea of business ampersands. Joel Evey manages the “look” of the brand. The tiny rabbit in their Instagram profile photo is another nod to Beuys. And so, of course, is their work. In the same spirit that Beuys showed in his efforts to marry art to life with purpose, Felt + Fat strives to create uncommonly beautiful and purposeful forms that celebrate their utilitarian use. 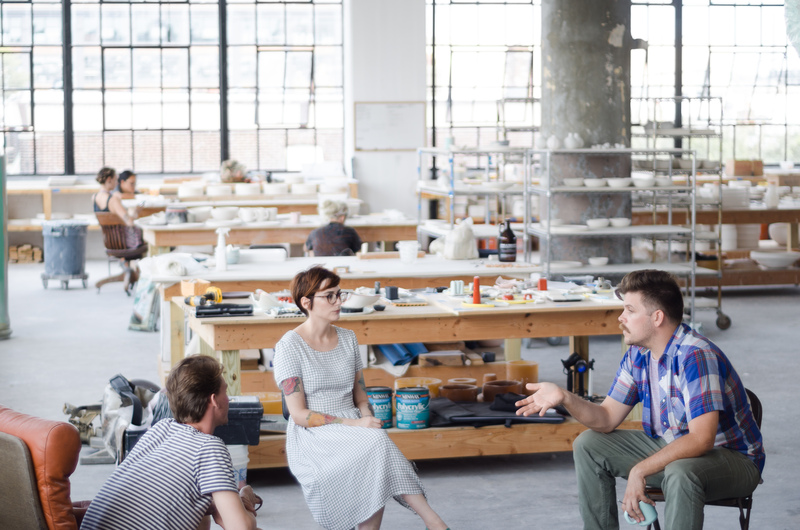 Work that engages with a person through the collaborative effort of artists is their ultimate goal, and that potential their prize. Add to this their desire to maintain a high level of production while still personally having a hand in the creation of each individual piece, and you can easily wonder where these two find the drive and inspiration needed to work at their caliber as artists and businessmen. 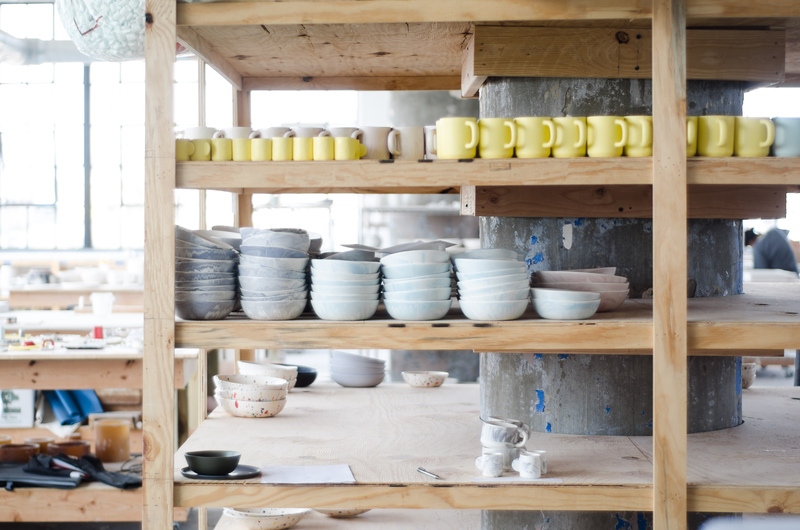 To that end, both agreed that a fascination with raw materials and their potentiality was an essential driving force for Felt + Fat, as was further applying that inspiration to their own wares, by sourcing materials locally and mixing their own proprietary clay bodies and glazes. 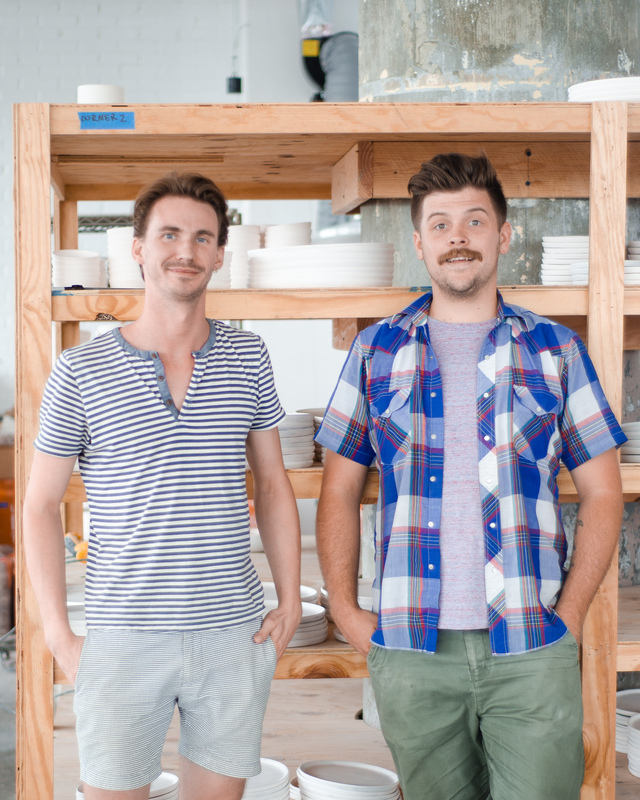 Both Nate and Wynn are proud of, and committed to, their provincial way of working from the ground up and sourcing locally everything from their raw materials to the artists with whom they collaborate. When we started to talk about creative resources for staying inspired personally as artists, the differences between these two artists showed themselves fundamentally. Soft-spoken and thoughtful, Wynn tended to warmly cup the edges of our conversation, letting Nate take the reins, but on the topic of inspiration he became more animated and his response was immediate. “Being outside, especially where I grew up in Southeastern Pennsylvania,” he says, and charms us with his earnest connection to the earth and his materials. Clay in particular is inspiring for Wynn as a medium that can be influenced and altered endlessly. Having studied architecture, he is particularly fascinated by the ways that natural shapes and forms can serve their functions. Collaborations with other artists, like woodworkers, afford him the chance to experiment and express himself creatively. Nate was slower to respond, having given Wynn the floor to furtively try and stay on top of the F+F email queue from his laptop. He screwed up his face, thinking. “I think I’m most inspired by the work of other people,” he admits, in seeing successful designs that breathe new life into the industry. “I see new work and think about ways to tweak designs, or I see interesting uses of materials and consider ways to push or combine them with something else I saw,” he explained, “or I start thinking about how it can be manufactured, reproduced, at exceptional quality.” Ever the businessman, he loves to make efficient systems, and is more inspired by consistent, high-volume output of pieces that maintain their individual integrity. 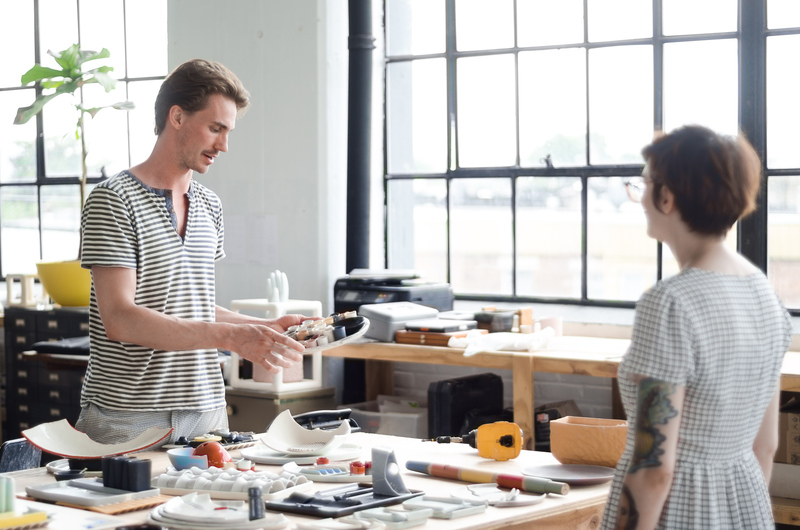 "I see all the great design and art coming out of this generation of makers and it gets me very excited," he enthused, his very posture opening at the thought. Between the two creatives, their fundamental contrasts and the balance they strike is the true magic behind Felt + Fat. Their dynamic makes it possible. So why porcelain, in particular? “It’s special because it’s like a blank canvas. 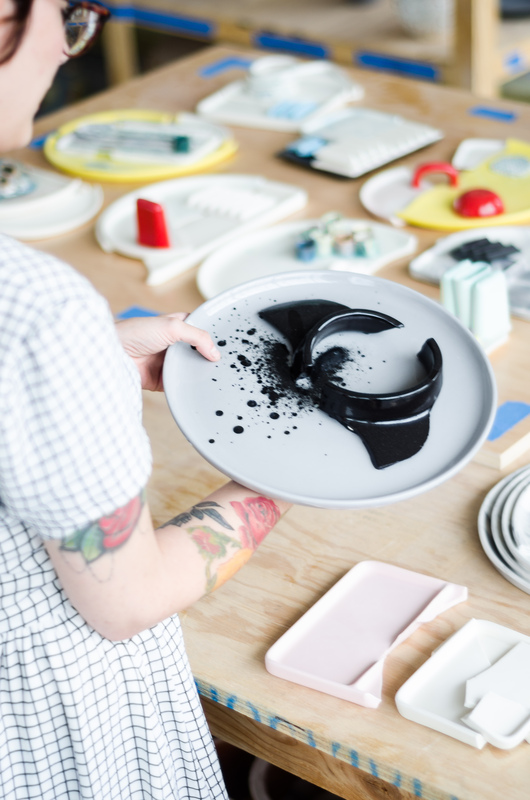 You can make it an entirely different clay, which is great for experimenting,” explains Wynn. 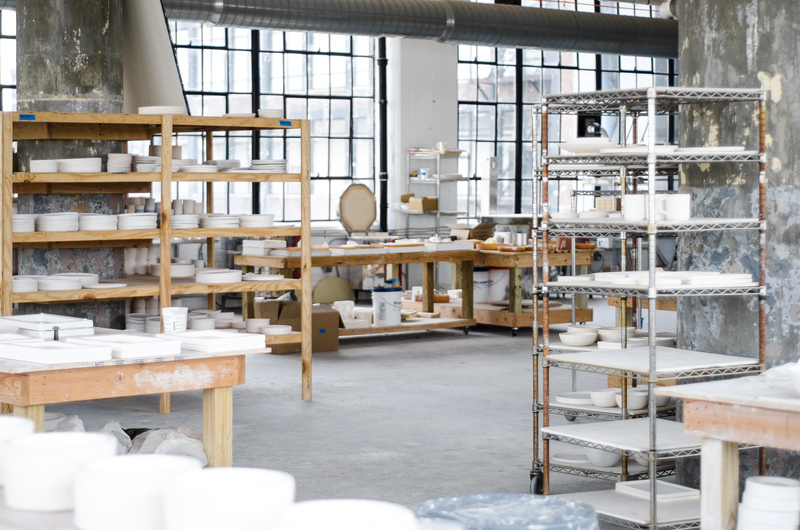 In the future, Nate and Wynn hope to expand manufacturing, but also stretch creatively through limited-run collaborations with other artists to create goods for the home (sick porcelain lighting fixtures, anyone? ), or opportunities like Steinbeisser’s Experimental Gastronomy dining event. 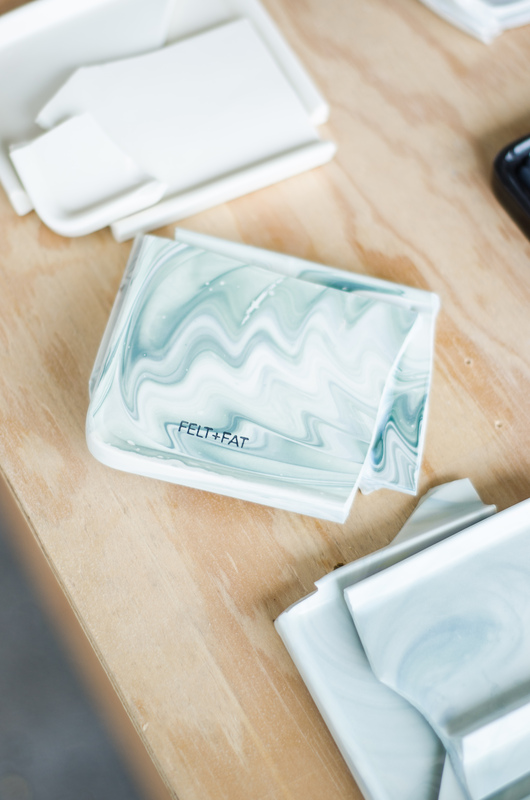 For this exclusive meal, Felt + Fat was tasked with creating “peculiar and unexpected” dinnerware that combined repurposed pieces with new ones to create one-of-a-kind bowls and plates in collaboration with the bon vivancy of three Michelin-starred chefs. Wynn eagerly showed us what they’ve created for the event so far, set for the end of the month in California, pointing out the many details that make up a single plate and remarking about the origins of each (a broken bud vase top, an artful smattering of the day’s leftover glaze drippings). He hopes, as with all of Felt + Fat’s work, that people will be encouraged to pause and think about how each piece came to be and the collaborative energy imbued into every detail. “Our work is not ordinary and exists from relationships and needs, and then the hands that helped make each one,” he mused, with a genuine assertiveness. Nate joined us with a nod of agreement. "It's all about connections, be they material or personal," he emphasized. "I see endless potential for collaboration and production." The sun began to slink down the sky, the studio glowing in the fiery ending light. Both Nate and Wynn had hours of work yet. Shadows casted. 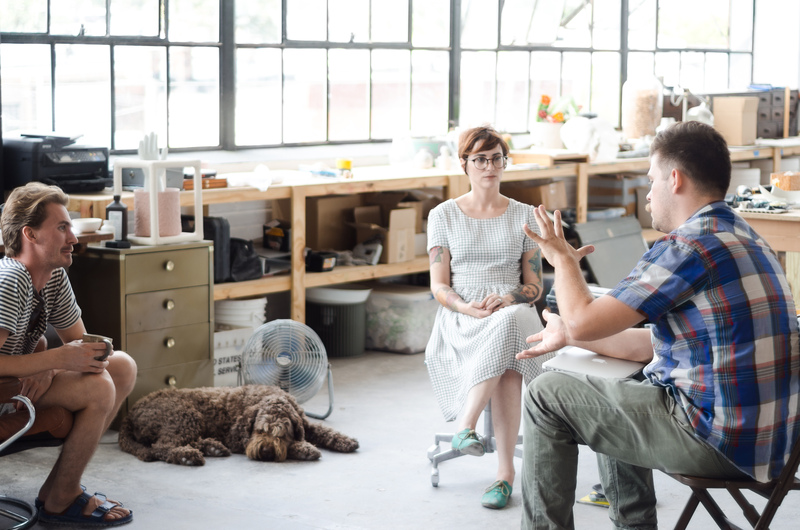 We said our goodbyes to the Felt + Fat team, grateful for their warm and gracious hosting, and gave Rufus some friendly claps on the back (from which came clouds of dust, familiar to all ceramicists) as he escorted us out. 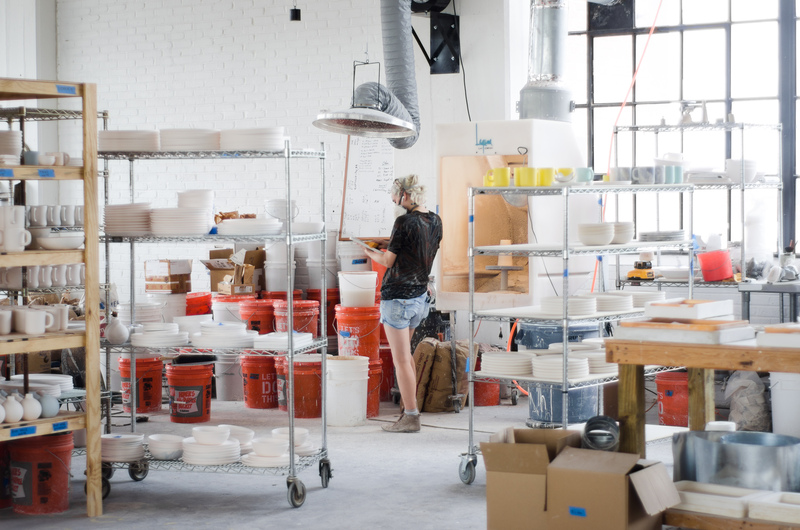 Leaving, we felt as if we knew some beautiful, potent secret: perhaps one of the most recognizable teams behind the current “clay renaissance” is hiding in plain sight, modestly creating their transcendent wares from the roughness of North Philly. Follow Felt + Fat on Instagram, and check out their work. 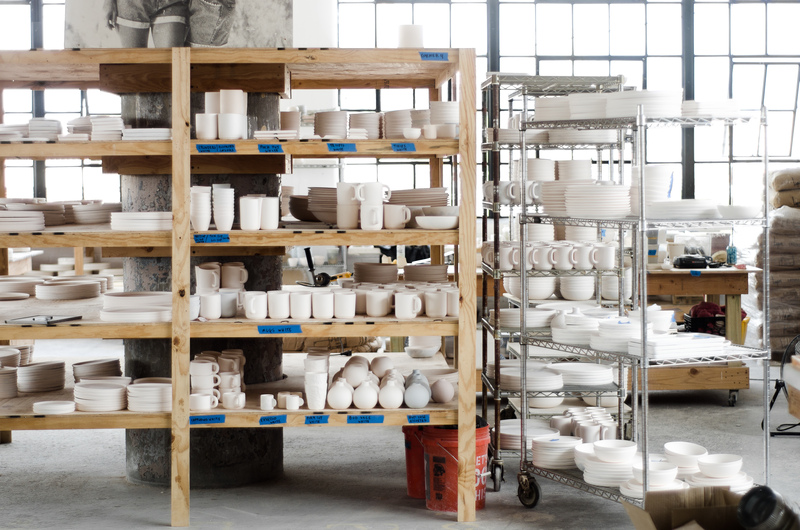 Stay connected with the Ceramic Shop on Instagram.